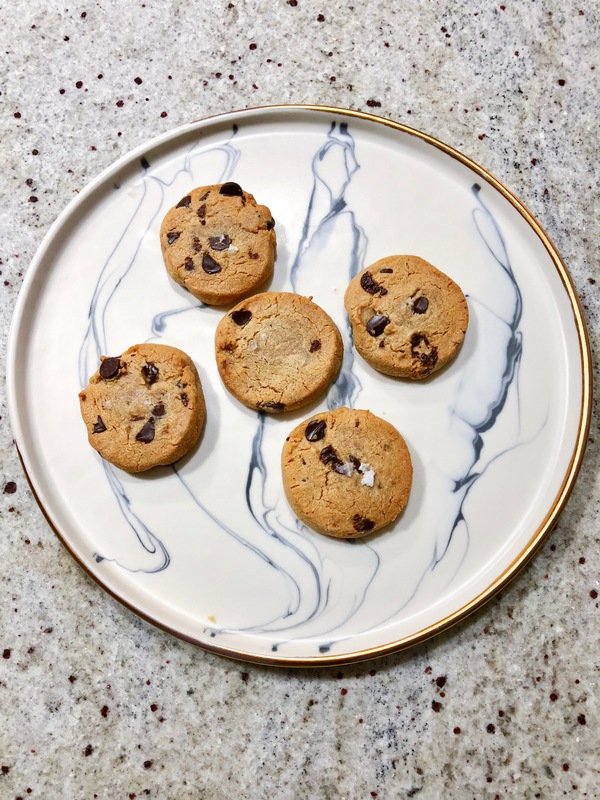 Who doesn’t love Alison Roman’s Salted Butter Chocolate Chip Shortbread that went viral on the web. I mean every baker made that recipe! #bakergoals right? Find her recipe on her new book Dinning In which also became a Best Seller. Then I was also inspired by the famous Capello’s cookies and wanted to merge those 2 ideas together in this recipe. Watch my YouTube video on how to make this recipe. I adapted these cookies from Yummy Mummy Kitchen. rubber spatula or wooden spoon, stir the wet ingredients into the dry ingredients until completely combined. The mixture will be crumbly but should stick together when pressed between your fingers. Place the dough onto a sheet of plastic wrap and form a log with your hands. Wrap tightly in the plastic and place in the freezer for 20 minutes to firm. Preheat the oven to 350 degrees F.
Unwrap the dough and cut into ¼-1/2″ thick slices. Place on a perforated cookie sheet lined with parchment or a Silpat. Bake for aprox 8-11 minutes, or until lightly golden brown. Remove from tray and let cool on a perforated tray. Store in a recycled salad container (the ones that have washed spinach) at room temperature for about 4 days. These cookies are soooo good! I am not usually a fan of shortbread cookies so I didn’t get my hopes up when I made these at one of your classes, but they truly impressed me! I’d make them again. Hey Buddy!, I found this information for you: "PALEO SHORTBREAD". Here is the website link: https://www.vanessamusi.com/paleo-shortbread/. Thank you.